The Good News Today – US Regime Change in Progress! US Regime Change in Progress! When the neocons wanted to invade Iraq and overthrow its government, they spent a good deal of time trying to convince us that they didn’t just want to invade Iraq and overthrow its government. No, it was all about 9/11 and WMDs and US national security and ultimately about “humanitarianism” in the end. We would be greeted as liberators, they said. They tried to make the case over the course of months and even years and even involved Congress in the effort: the Iraq Liberation Act was passed way back in 1998! It’s all different now. In January, on the eve of Venezuelan president Nicolas Maduro’s second term, a politician all but unknown in Venezuela got a call from US Vice President Mike Pence urging him to invoke Venezuelan constitution article 233 and declare himself “interim president.” Pence promised US backing for the move to overthrow the elected Venezuelan in favor of a politician who had never even run to be Venezuela’s president. Ah, but they claimed that conditions spelled out in Venezuelan constitution’s article 233 were met for this obscure politician, national assembly president Juan Guaido, to assume the office of the presidency. Of course article 233 says no such thing, but the US regime change express correctly counted on a compliant mainstream media to let that whopper go unchallenged. Checking their claims is actually quite easy, as article 233 is pretty straightforward. It lays out six scenarios whereby the head of the national assembly can temporarily assume the duties of the president for 30 days for the express purpose of holding another vote to fill the vacant presidential seat. None of the conditions have been met. 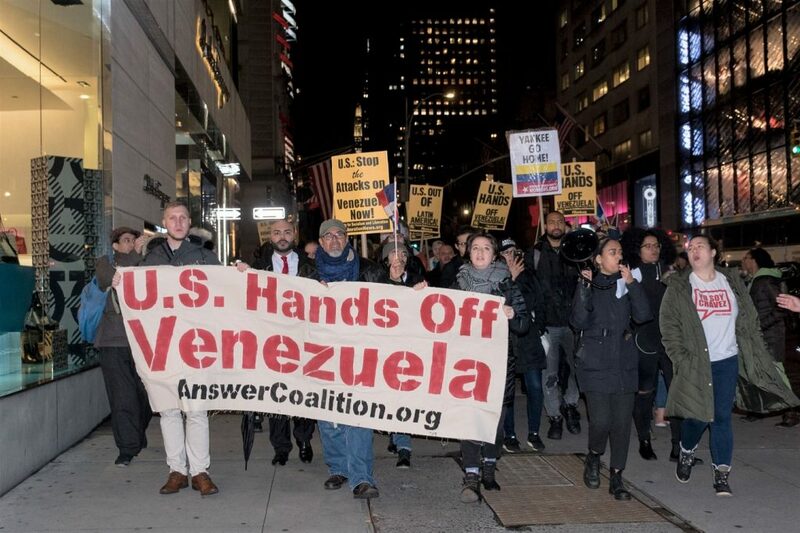 While it’s preposterous to assert that US foreign policy should be driven by the desire to enforce another country’s constitution (while violating ours), even if we were to allow that to slip in this case there would simply be no legal case to recognize Juan Guaido as Venezuela’s president. But legality has never bothered the neocons in their global pursuit of murder and mayhem. The tip of the spear of the US assault on Venezuela for the purpose of installing its puppet into office is none other than a massive store of “humanitarian relief” on the Colombian side of the border that has this past week or so been delivered by US military transport aircraft accompanied by US military personnel. And who’s there on the ground to supervise the delivery of this “aid” to Venezuela? None other than the guy whose specialty is hiding weapons in humanitarian aid shipments, Elliott Abrams! 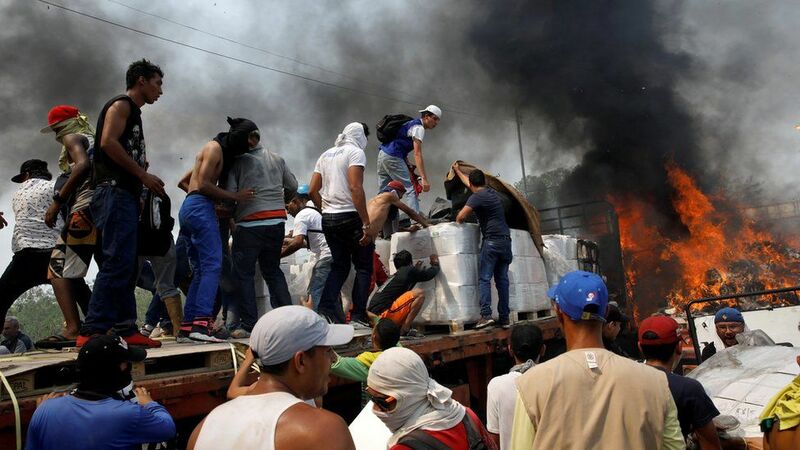 Anyone want to bet there are plenty of weapons in this “aid” shipment to Venezuela to arm the rebels? We’ll be told, of course, that they are only “moderate” rebels! Each US regime change operation has some of its own unique characteristics but this one is particularly cynical: the weaponization of food and medicine and the militarization of its delivery. “But Maduro is refusing international humanitarian aid while his people are starving! He’s practically throwing babies from incubators!” Except he’s not refusing humanitarian aid. He recently received a shipment of 900 tons of aid from China, Cuba, Turkey, and Russia. The UN and other international relief agencies are also delivering aid. 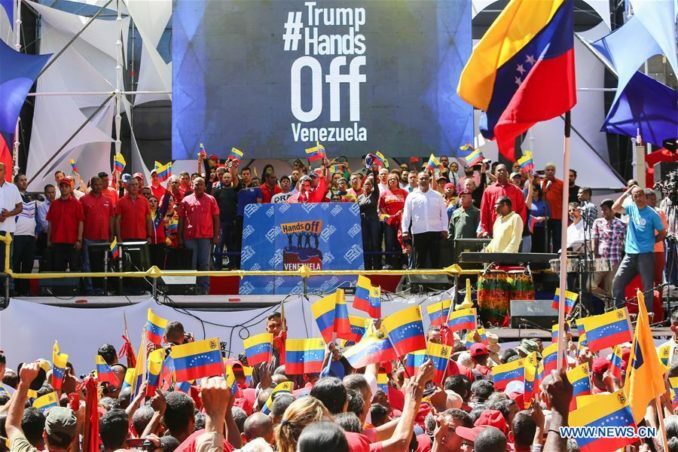 The Venezuelan government is only refusing aid coming on US military transports carried in by US military personnel whose commander-in-chief has openly vowed to overthrow the government. Would Trump block an aid shipment barreling up from Mexico from a China that was in the middle of overthrowing the US government? Delivered by armed members of the Chinese military? It’s like the Trojan horse but they didn’t even bother with the horse! So last weekend was showdown day, where the self-appointed “President” Guaido crossed over to neighboring Colombia to be flanked by the Colombian president and personally bring in the US “humanitarian” aid past the Venezuelan government border guards. It was a recipe for a bloodbath and that is exactly what the neocons wanted and got. VP Mike Pence was urging this bloodbath on, and unsurprisingly framing it as a kind of religious holy war as he tells them “¡Vayan con Dios!” – go with God. But…as US investigative journalist Max Blumenthal found, they’re not empty. It’s another US lie. Every US instigated “regime change” operation must have snipers, which serve the critical purpose of injecting white hot fear into the population and mobilizing even the theretofore unmoved to action. And right on cue, Venezuela has gotten its snipers! “Masked men” who are shooting protesters at random. Of course the local population will take them to be undercover government security forces shooting at unarmed innocents and will begin to side with the anti-Maduro forces. Except they will very likely be either armed opposition forces or perhaps even foreigners (read: CIA) sent in to perform this critical task. That’s exactly what happened at the Maidan in Ukraine. It was the sniper fire into the crowd that mobilized the population against Yanukovich and in favor of the revolt. Except the people doing the shooting turned out to be the protesters themselves! Pop music concerts are also common features when a regime change is in operation. I remember being in Minsk, Belarus for the 2005 presidential election, where the US had backed a candidate to oppose the long-serving and popular Alexander Lukashenko. There, an “impromptu” rock concert was illegally staged in the city park after the mandated pre-election campaign silence had taken effect. The illegal concert turned into a political rally for the US-backed opposition and the US-backed candidate himself appeared at the conference. And again going according to pattern, US-backed Juan Guaido showed up at Branson’s pop concert and turned it into a political rally! But one problem for the coup planners: no one attended Branson’s big effort. While the Washington Post claimed that 200,000 people jammed into the concert arena, in these days of drone photography we can tell that the actual turnout was about one tenth that number. Thus far the US coup is not materializing in Venezuela. The military has by and large remained loyal. But that is not a victory for Maduro: the neocons and regime changers will now ratchet up the violence. Now they are going to do it the hard way. The “humanitarian” aid dangled just over the border in Colombia is not meant to help the people. It is meant to facilitate regime change. 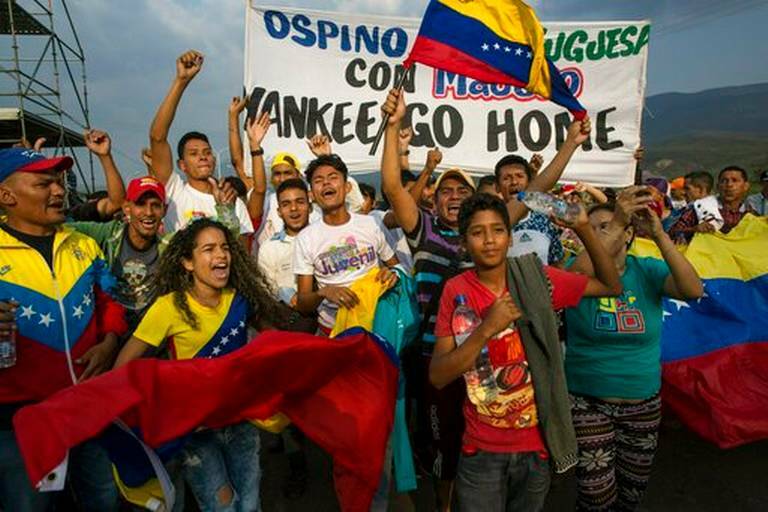 It is a win-win for the regime changers: If the shipments make it into Venezuela it demonstrates that Maduro has lost his grip; if Maduro successfully keeps the US crates out of his country it underscores the “he’s starving his own people” narrative and will likely kick into effect an R2P claim to “justify” an international military effort to overthrow him. This is the Libya model combined with the Syria model. The result will be a massacre and decimation of the country’s economy and already low standard of living. It is a US war on a sovereign nation and Congress is silent. Antiwar liberals are silent. Libertarians are so mesmerized by the word “socialist” used to describe the Venezuelan economy that many have dropped the non-aggression principle and are cheering on an operation by the same US government that many of them don’t believe are competent enough to even build roads at home! No one cares to stop this redux of every failed US regime change operation because no one seems to see that this is what it is. The lies are openly flowing and duly amplified by the mainstream media. Oh…yeah…it will work out this time.